Between Thanksgiving feasting, leftovers, and dinner out at a steakhouse, we’ve been eating entirely too much meat. Or at least more meat than normal. I’m ready for vegetables. Thanks to my CSA box from Full Circle Farm, all I had to do for inspiration was open the refrigerator. Giant leeks caught my eye first: four leeks, weighing a little over a pound each. I also noticed Delicata squash, a mild-tasting, thin-skinned heirloom variety that had been in the refrigerator a couple weeks. The skin was shiny and the flesh was firm, but it was time to cook the Delicata. The traditional onion market (Zibelemärit) opens November 26 in Berne, Switzerland. Zorra of Kochtopf blog decreed the 26th to be Onion Day, and challenged cooks around the world to use onions in honor of the market. I decided to take up the challenge and showcase Delicata squash, onions, and leeks, a member of the onion family. Kimolos, a tiny Greek island in the Aegean Sea, is part of the Cyclades island group. In 2001, less than 800 people lived on its 20 square miles. That year, Filena Venardou, who came to Kimolos as a teacher, published a book of traditional recipes from Kimolos: Η Κουζίνα της Κιμώλου (The Cuisine of Kimolos). Winter Squash with Onions (Κολοκύθι Κόκκινο με Κρεμμύδι) is one of the traditional recipes Venardou collected. She says winter squash is much tastier than summer squash, and the Kimolos method of cooking it in hot oil gives the squash a crispy crust and seals in its juices. I adapted Venardou’s recipe using Delicata squash and finished the fried squash and onions with a dusting of the dried wild thyme we collected last summer in Greece. The resulting dish, which must be served hot, was robust and filling. It would be a good side dish for any kind of meat or poultry, although Venardou suggests serving it as an appetizer and we enjoyed it as an Onion Day main course. To round out the meal, I made Leek Pilaf (Πρασόρυζο), an easy and flavorful Greek dish enjoyed during the many fasting periods that fill the Greek Orthodox calendar. The light, herby flavors of dill and mint contrasted nicely with the rich flavors of fried squash and onions. Since it is difficult for me to cook without using onions or garlic, it is fitting that Onion Day closes my first month of serious food blogging. It is also the day on which the thousandth visitor stopped by my blog. Happy Onion Day! Delicata squash is easily peeled with a sturdy vegetable peeler. After peeling the squash, cut it in half, use a spoon to scrape out the stringy centers and seeds, and dice the flesh. Put the diced squash and onions in a bag with the flour, salt, and freshly ground pepper. Shake the bag around so the flour evenly coats the vegetables. Dump the floured vegetables into a strainer and shake the strainer to remove the excess flour. Heat 1/2” of olive oil in a large frying pan until it is very hot, but not smoking. Add 1/3 of the floured squash and onions to the hot oil, and fry until the undersides are browned. Turn the vegetables over, and brown the other side. Using a slotted spoon, remove the vegetables from the oil and place on paper towels to drain. Repeat with the remaining vegetables, being careful not to crowd them in the frying pan, or they will steam rather than brown. Sprinkle the crushed dried thyme over the browned vegetables, taste and add salt or freshly ground black pepper, as needed. Leek pilaf is good on its own, or as a tasty accompaniment to any kind of fish, seafood, or poultry. 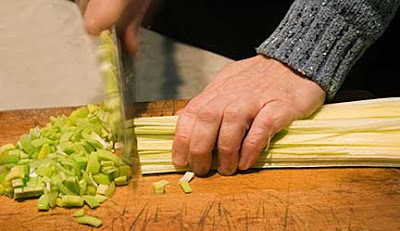 Before dicing leeks, be sure to slit them lengthwise and clean thoroughly under running water to remove the dirt and grime that often is trapped between the leek’s layers. Sauté the leeks, lightly seasoned with salt and freshly ground black pepper, in olive oil until they soften and start to turn golden around the edges. Add the rice and sauté for one minute, stirring constantly to evenly distribute the leeks and oil. Add the tomato paste, and thoroughly mix it into the rice. Stir in the water, dill, and mint, bring to a boil, cover, and turn the heat down as low as possible. Cook for 20 minutes, or until the rice absorbs all the water. Turn off the heat, and let the pilaf sit covered for 15 minutes before serving. Taste and add salt or freshly ground black pepper, as needed. Delicata is among my favorite squash varieties. Laurie, this is first-rate, but then *all* your recipes are! Gotta get me that cookbook of yours. This dinner looks tasty. I like the mint and dill in the leek pilaf. Good read and these are two new dishes for me. Is it great that Greece has nuisances with food, rites, customs from island to island and region to region? I'm glad there's still more to discover with Greek food. It all looks and sounds delicious as always!I love to visit your site and read about my favourite place to be...Greece!!! I really like the leek pilaf! It sounds really amazing. Oh, yum! What a great way to get your veggies on...and I love the sound of that leek pilaf. Delicious! Very informative entry and all looks so delicious! Susan, you are so right about Delicata; it is one of the best winter varieties. Thank you for the kind words AND ordering a cookbook. I hope you like it! Kevin, mint and dill are a great combination, and go well with most vegetables. Greece has a lot of interesting regional foods, and one of my goals is to show people some of that variety. And I'm having a good time doing it! Valli, I'm so glad you're visiting, and that we share a fondness for Greece. Anh and Genie, I just got home late from a class and powered down the cold leftover pilaf. Yum. It was good that way too. Glad you both liked the recipe, thanks for stopping by! Laurie, I am excited about seeing so many Greek recipes here, I bookmarked it! My best friend in elementary school was Greek and I remember the festivals and some vague memory of the food. Maybe I shall find something here I remember! Your leek pilaf is almost the same with mine, except for the mint. Shall try it this way soon. About the squash. I don't know this variety but we have the red pumpkin, we do pumpkin pies. Do you think I can try the recipe with this variety? Zorra, Onion Day was fun - thanks for organizing it! 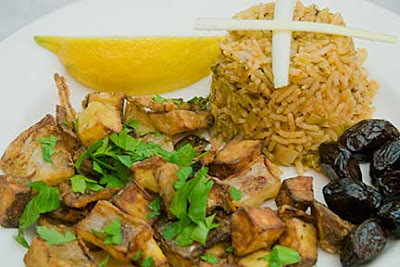 Gretchen, so glad to hear you like Greek food and enjoyed your visit to my blog. Even if you don't recognize them, I hope you enjoy the recipes. 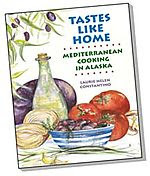 As for festivals, that's what got me started writing the cookbook -- first I was just going to write the recipes we serve at our Greek festival here in Anchorage. Then I got interested in it as a book project and the cookbook Tastes Like Home is the result. It turned out to have the festival recipes, and a lot more. Kim, would that you were Queen of the Universe! Thanks for subscribing! Ivy, yes the red pumpkin you have in Greece would work with this recipe, and I suspect that is what was used in the original recipe on Kimolos -- can't imagine they have Delicata squash there. As for the mint in Prasorizo, it's fine without it, but it's a nice addition and adds to the flavor. 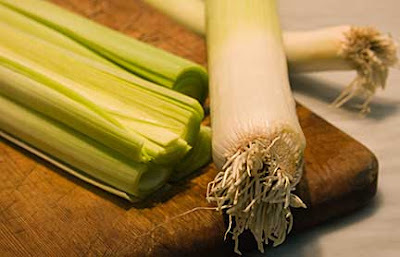 The most important thing is to use plenty of leeks. This looks delicious1 Botht the pilaf and the squash and I love the prunes? that you've put alongside. All the flavours compliment each other beautifully. Thanks ronell -- the flavors did combine well. Those are dried olives in the picture! And they do look kind of like prunes. Andaliman, I agree, any kind of pilaf is good, as is just about anything you make with leeks. Thanks for visiting!